Melt sugar in a small saucepan on medium heat, taking care not to burn the sugar. Slowly add coconut cream to the melted sugar, one tablespoon at a time, stirring it in well after each addition. Stirring constantly, bring the syrup to the boil then remove from the heat and allow to cool. Combine dry ingredients in a large bowl and whisk ingredients together. Fold the sugar syrup into the dry ingredients and mix well. 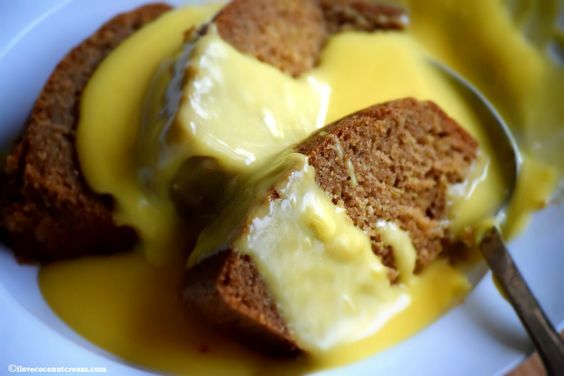 Pour the batter into a buttered 2 litre pudding tin and steam for 1½ hours in a large pot over the stovetop. If you don’t have a pudding pan, simply use a container smaller than a large pot like a rice cooker insert and simply cover with tin foil.